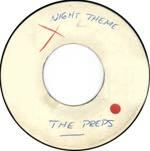 The Preps - Night Theme c/w What? This single sports a true to the original cover of the Mark II hit backed with a very infectious groove with vibe lead. "Night Theme" is a moody number with chamber reverbed drums and haunted organ in the lead. It's a pretty simple song, but it sure does stand up well over time. The Chantays covered this on their first album. This was a successful track for the Preps, issued on Dot nationally. Sly Stone is the bassist on this track. Originally cut by the Mark II. "What?" may be the cooler of the two tracks here. The vibe-lead plays a catchy melody line while the band plays a moody kind of R&B backtrack on organ, bass, and drums. "What?" is an example of how catchy very simple melodies can be. Way fun!